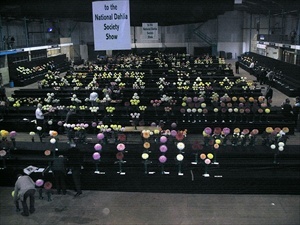 The society entered the National Show, held at the Royal Bath & West Showground, Shepton Mallett, Somerset. The main society entry is for the "Herbert Brown" Perpetual Challenge Cup. In the picture below, MDS president Les, is pleased with the 3rd place achieved this year. Well done MDS! 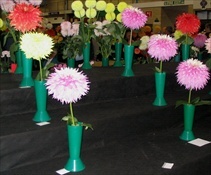 John Digweed won the two vase with Rycroft Jan and Suzanne Marston, and the four vase with Rycroft Jan, a Seedling, Lilac Jan and Suzanne Marston. Roger Turrell was 1st in the small semi cactus class with Avoca Blush to win the "G.F.Crowley" Perpetual Challenge Cup - looks like you are blushing a bit there Roger! 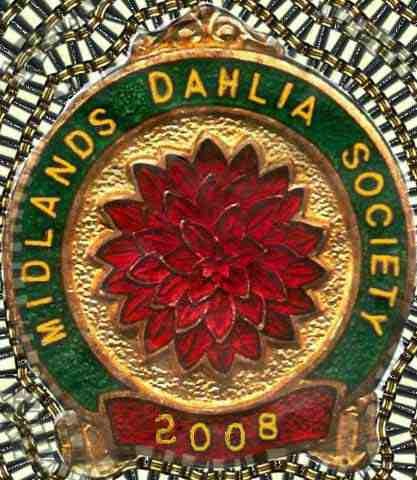 DJ Cave wins the "Silverhill" Challenge shield - Large Semi-Cactus with Hamari Accord, a seedling, Pride of Heemstede, Ruskin Splendour, Kenora Challenger. Ron Guest wins the 2 vase Medium Dec class with Avoca Cheyenne and Alf's Mascot. 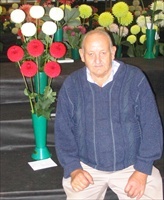 Brian Caswell won class 68 - 2 vase Small ball, with Scar Tango and Elmden Supreme. June Davis has had an outstanding year with Giant decs. She won class 40 with Alf Ramsey. Brian Caswell was third with Alf Ramsey,, Wanda Capela and Bryn Terful.